Looking for a New Subaru BRZ in your area? CarGurus has 634 nationwide Subaru BRZ dealers with 1,126 new car listings. The BRZ is an odd car to come from Subaru. It features rear-wheel drive instead of the usual symmetrical all-wheel drive of the brand’s products, and it is more about style and fun than practicality. There are four seats, although Subaru calls it a two-plus-two configuration because the back seats are meant mainly for car seats and small children. Power continues to come from a familiar 2.0-liter flat 4-cylinder engine with 205 horsepower and 156 pound-feet of torque along with a standard close-ratio 6-speed manual transmission. 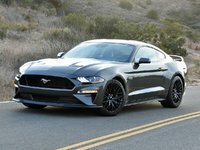 If you choose the optional 6-speed automatic, horsepower curiously dips by 5 to 200 and lb-feet of torque drops to 151. The horsepower and torque peak at 7,000 and 6,400 revolutions per minute, respectively, so this is definitely a car that rewards rev-happy drivers. Unfortunately, those who have been clamoring for a higher-horsepower variant will be disappointed since this is the only engine. That said, it’s still lightweight, so the 60-mph mark comes up in a bit over 6 seconds. Furthermore, since the boxer engine is spread out horizontally, its center of gravity is lower than in most cars for improved cornering. Both basic BRZ trims return for 2018. Premium kicks things off with 17-inch alloy wheels, LED headlights, a rear wing, heated side mirrors, a 6-way manual driver’s seat, cloth upholstery, Bluetooth, a single USB jack, and the latest Subaru 6.2-inch touchscreen infotainment system. Limited adds LED keyless access and start, fog lights, an instrument cluster LCD with performance data, an upgraded 7.0-inch touchscreen infotainment system with navigation, Apple CarPlay, and Android Auto connectivity, dual USB jacks, leather and Alcantara upholstery, and heated front seats. A short-throw shifter comes standard for the manual transmission on the Limited, but this trim unlocks the automatic transmission. Other options include paddle shifters for the automatic transmission, wider 17-inch wheels, Brembo brakes, and Sachs performance shocks. Lastly, there’s the limited-edition BRZ tS. “tS” stands for “Tuned by STI,” and it is sort of a half-step between a base Subaru and one with the brand’s full STI treatment. 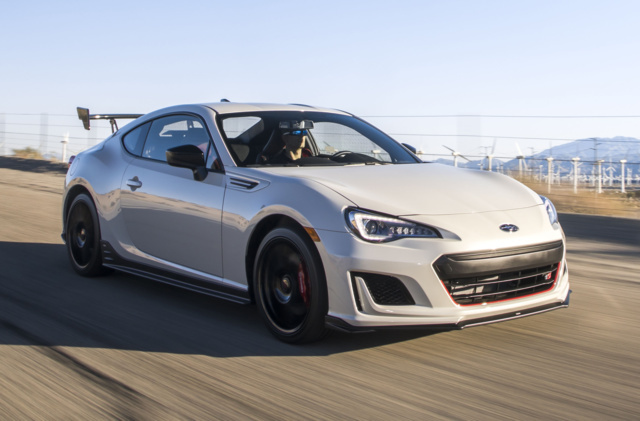 In the case of the BRZ, that means aggressive exterior styling with exclusive red accents, such as restyled front and rear bumpers with under-spoilers and a giant rear wing that can be manually adjusted. The Brembo brakes and Sachs performance shocks from Limited are standard on tS along with STI springs and 18-inch black painted STI wheels. Subaru will produce just 500 tS units. Given its age on the market and mission in life, the BRZ employs only the most basic of safety equipment. It has a standard reversing camera and six airbags, but no advanced safety features are on offer. During the Insurance Institute for Highway Safety’s (IIHS) latest battery of tests, the 2018 BRZ scored Acceptable on the Small Front Overlap test and Good everywhere else. The BRZ is certainly a niche product. It’s not nearly as powerful as other sports cars in the same pricing territory, but it makes up for that with balanced looks and engineering, generally promoting fun at any speed. Kyree is new to the automotive journalism scene, but has voiced snarky public opinions about cars for quite some time. When he's not drooling over the latest European luxury sled, he's designing web experiences or writing backend code. What's your take on the 2018 Subaru BRZ? Blaserbrb I love the car so much, I traded my modded 2016 WRX for it. You really have to drive it to experience it. If the dealer would not have leant me the car for the weekend I probably would still be driving the WRX. Have you driven a 2018 Subaru BRZ? Enter your zip to see incentives for a new BRZ in your area. 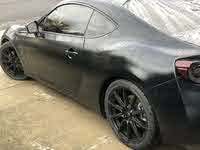 Looking for a Used BRZ in your area? CarGurus has 912 nationwide BRZ listings starting at $10,487.